I ordered two Drop1.2x scrubbers which arrived yesterday. I installed both in my 80 gallon freshwater BB fish tank (about 75 gallons of water). They were both on yesterday for about 5 hours; starting today they are going 12on/12off and I will check progress on day #7 (19 June). Starting params: pH 6.8-7.0; ammonia: 0.00; nitrite: 0.00; nitrate: ~60+; phosphate: ~10+. Primary filtration is a Marineland C360, which has been cycling for a couple of years. Secondary filtration are two TLF reactors, one with Seachem Matrix and the other with crushed coral. I had a problem keeping the pH up until I added the crushed coral. I may replace the Matrix with more crushed coral, since I don't think it's doing very much and I'd like to get the pH above 7.0 and get more carbonate into the water. I also recently added a moving bed filter with Hel-x media, but it has not started to cycle yet. Once it starts cycling I intend to retire the Marineland C360. Note that there is a lot of surface movement; the streaks and blobs in the both photos are actually streams of air bubbles on the surface. In the first photo the water seems to appear cloudy, but it's not. It's full of very tiny air bubbles swirling around at that end of the tank. The moving bed filter super aerates the water so its always full of air bubbles. In the second photo the water looks green, but it's not. I have a dark green background on the glass and lots of plastic plants at that end which are out of focus due to the surface movement and small bubbles mixing in the water column. Unfortunately, when I took the photos, all the fish decided to hide at the other end of the tank, although you can see one of the big apple snails in both photos. I have Julii, Copper and Pepper corys, Buenos Aires tetras, Chinese Golden and Rainbow barbs, Platys, a couple of male Dwarf Gouramis, and an ancistrus. Everyone is active and healthy. Last edited by amwassil; 06-14-2015 at 12:52 PM. Will be nice to follow. I see you opted for bubbles, instead of bubble-free placement above the waterline. How are you hanging them? They're both hanging from an S-hook. In the second photo you can see these. So, here I am 1 week in! 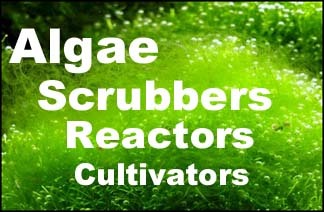 I pulled both scrubbers and examined them this morning and there is zero visible growth. I've increased the lights/on time to 15 hours as of today. I left the screens in, since the surfaces are still white. I also got around to reading the instructions and discovered that I should have left the air pump on 24 hours daily, which I did not do. I had it plugged into the same circuit that turned the scrubbers on/off at 12 hours. I've now plugged the air pump into a separate circuit that is always on. So, I'll check in again next weekend with another update. Yes that will probably make a big difference. Note that the darker area near one end is a shadow from the lighting of the photo, not a difference in algae growth or colour. I have removed the black screens, but otherwise will make no other changes unless advised to do so. The scrubbers lights are 15on/9off and air 24on. 21 days and I have bright green growth in both drops. It's even growing on the inside of the bare plastic lids! There is significantly more growth than last week, but I didn't have time to take photos this morning. I'll try to take photos tomorrow morning and add them to this post. By next weekend there should be enough growth to start looking impressive. Not enough to harvest yet ;-) but growing in the right direction! nice! do you plan on taking the other filters out and just using the drops? No, I don't plan to remove the other filters. As I noted in the original post, as soon as the moving bed filter cycles, I'm going to retire the C360. Not sure yet about the two TLF reactors. My primary goal is to reduce nitrates and phosphates with the drops. If they do that I'll be happy. How quiet is the DROP when mounted just above the waterline?